When someone sends you a web enquiry or emails you for a quote, pick up a phone within 5 minutes to thank them for the enquiry and clarify exactly what they need. You may find they need more than what they are originally asking and you end up selling more and providing a better service for them. People I have coached to do this have literally tripled their sales. It happens to me constantly that my new clients tell me the reason they chose me was because I responded quickly . Now you might think this shows you are desperate but please change your thinking around that, think instead that you are providing great service. Doing this also deters the prospect from pursuing other quotes if you can satisfy their needs quickly and easily. 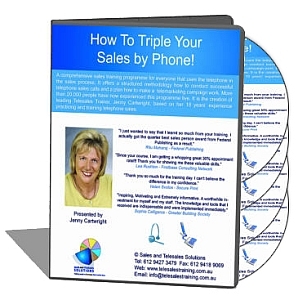 “Telesales Mastery” – The Most Practical Telesales Course Ever Written. It comes with exercises, questions and answers at the end of each chapter and video links too. Everyone in a sales team is recommended to study this ebook/course for self training. N.B. I will be available for training in Perth 6, 8, 9 May, Denver/Los Angeles 31 July, Wellington 10 June, Auckland 13 June ,Brisbane 23 and 25 Sept, Melbourne 7, 9 Oct . I will already be there for other training commitments.